All documents that are notarized in a foreign language must be accompanied by an English translation signed by the translator with the translator’s signature notarized. The Secretary of State’s Office can verify the signature of any elected or appointed official whose signature is filed with the Office. The document must be signed by the elected official, NOT a Deputy or Assistant. The only exception to the above rule is that office employees in the Office of the Probate Judge in Richland, Greenville, Horry and Charleston counties who are authorized to certify marriage licenses for these counties may sign documents as their signatures have been filed with our Office. 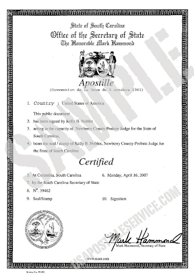 Certified copies obtained from the county must bear the original signature of the elected official of that office (i.e. County Probate Judge or County Clerk of Court). If the county official is not an elected or appointed one, his or her signature must be notarized. 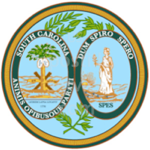 Documents that are signed by individuals who are not elected or appointed officials whose signatures are not on file with the Secretary of State’s Office must be notarized by a commissioned South Carolina Notary Public. School transcripts, report cards or letters MUST be signed by a school official and the official’s signature MUST be notarized. Records checks from the South Carolina Law Enforcement Division (SLED), local sheriffs or police departments must be signed by an official from that office and his/her signature MUST be notarized. The Secretary of State’s Office cannot authenticate a records check obtained from the Internet. Photocopies of vital records are not acceptable. All vital records must be certified by the issuing government agency. A Marriage License may be obtained from the county Probate Judge bearing the signature of the Probate Judge only or the license can be obtained from the Department of Health and Environmental Control (DHEC)’s Vital Records Division. A Divorce Decree may be obtained from the County Clerk of Court bearing certification including the signature of the Clerk of Court only, or obtained from DHEC’s Vital Records Division. A death or birth certificate can only be provided by DHEC’s Vital Records Division.